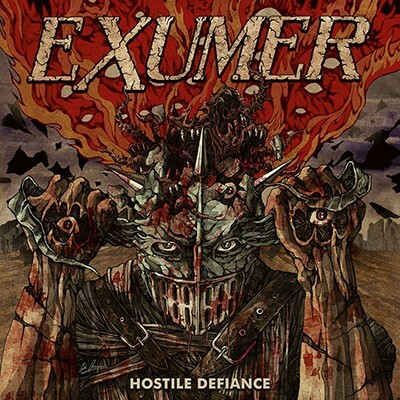 With "Hostile Defiance" the german Thrashers EXUMER deliver their third album after their reunion, three afters "The Raging Tides" the band is back with twelve Old School Thrash Metal bangers, no experiments, no nostalgia, just pure Thrash Metal deluxe. 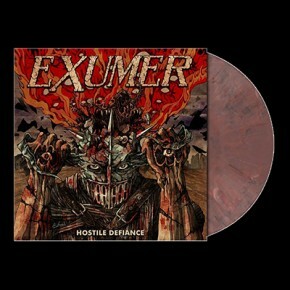 Saddly EXUMER never has been in the front row of german Thrash Metal, Speed Metal bands, but believe me they deliver the same high quality material as more famous bands like KREATOR, DESTRUCTION, DARKNESS, ... . "Hostile Regression" is truely a must in every Metal collection, get this ultra-limited edition, it won´t last forever. Limited edition of 200 hand-numbered copies on Pale Blackberry Marbled vinyl, this LP comes with XL poster, lyric insert, mp3 download and bonus tracks.